Banking Command Centre is the place to go when you want to record a payment, print official receipts, and reconcile your bank accounts. The Bank Register acts as your cashbook and show you all the entries recorded for deposit and withdrawal transactions. It shows you the running balance of your bank account and as such you will be able to know the status of your bank account immediately. Use the Spend Money option to record payments for expenses such as rental, salary, utility bills and purchase of fixed assets. You can also see the balance of your bank account when you are in the 'Spend Money' window, to assist you in planing your cashflow. You can allocate your expenses to the respective job codes, and also tag the relevant GST tax code to the expense payment. The spend money entry will be automatically updated in the Bank Register window. You can click on the autofeed arrow to make changes to this entry if necessary. After recording the expenses, you can print the payment voucher, and prepare electronic payments. You can print or email the payment notifications. 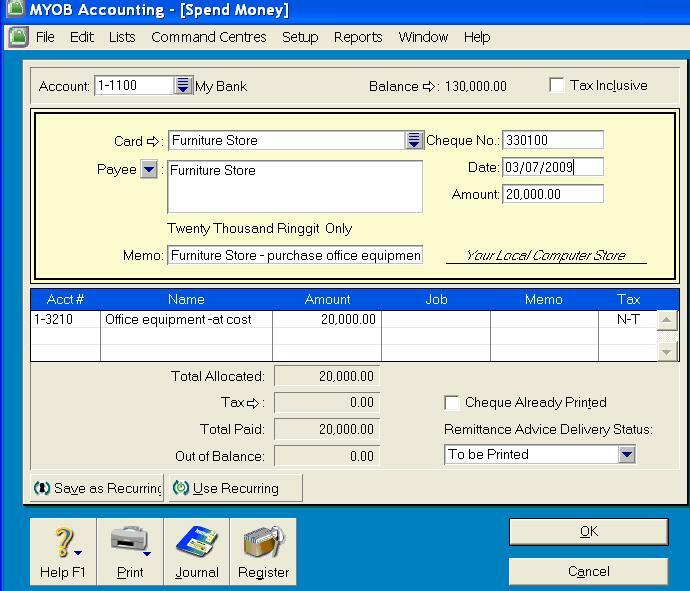 In addition, you can also get MYOB software to print out the payee name, cheque date, and amount, onto the cheques, thus making MYOB software a cheque printer. Using the Print Cheque feature in MYOB will definitely save you time, money, and best of all, minimise spelling errors. You can print a batch of cheques and payment advice, or use the Advanced Filter option to find and reprint a particular payment advice. You don't need a special printer, nor a special software. Bank reconciliation is an important part of book-keeping because you need to make sure that the cheques you have issued or received are cleared by the bank, and also you need to account for bank charges or interest earned on your bank account. In MYOB, reconciling your bank accounts has been made even easier. 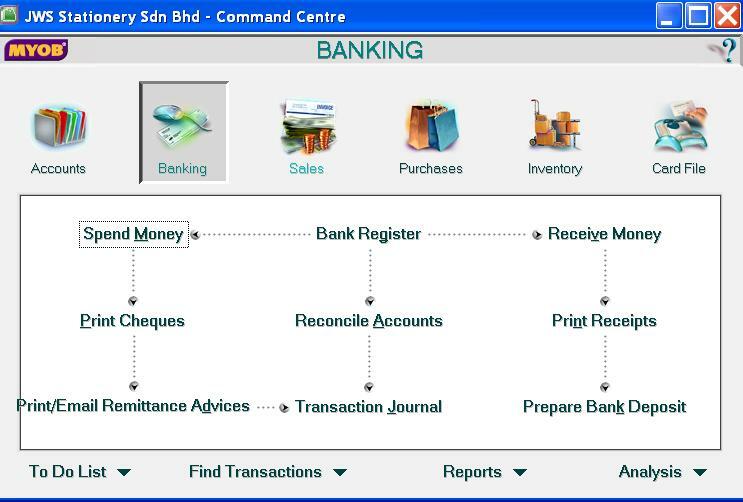 The process requires you to indicate the cleared cheques and deposits in the bank reconciliation wndow. Once every cheque and deposit in the bank statement is accounted for, you will be able to print the reconciliation statement for filing purposes. You can restrict which users are allowed to have accessed to the bank reconciliation function, to reduce the chance of errors going unchecked.